Easy fudge doesn’t get much better than this Chocolate Peanut Butter Fudge with its layer of creamy chocolate ganache swirled into the most amazing peanut butter fudge. How much do you love the flavor combination of chocolate and peanut butter? Well, you are going to go nuts over this incredible Chocolate Peanut Butter Fudge. It is the smoothest, creamiest, tastiest version of this easy fudge you will ever find. A thick layer of peanut butter fudge made using a combination of creamy peanut butter, peanut butter chips, white chocolate chips, and a pinch of salt is topped with a layer of decadent chocolate ganache (a combination of pure dark chocolate and heavy whipping cream). It’s like peanut butter fudge swirled with a chocolate truffle. It has a thicker layer of chocolate on top than our Tiger Butter Fudge. Both are insanely good! Plus, it’s pretty darn simple to make too. This homemade fudge can be made in the microwave in just a few minutes. It is so much easier than a traditional old-fashioned chocolate peanut butter fudge recipe which requires boiling the candy on the stove and using a candy thermometer. 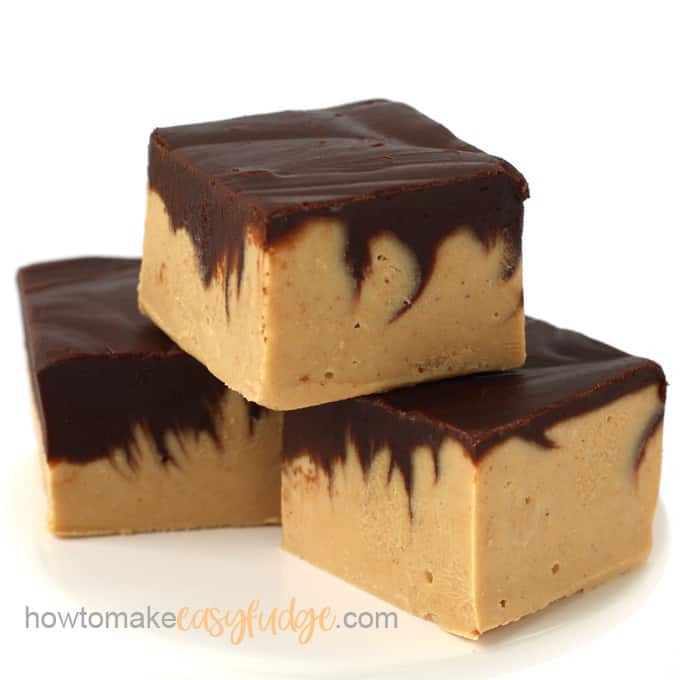 If you prefer a little more peanut butter to chocolate ratio, be sure to check out the easy fudge recipe for Tiger Butter Fudge. You can also just make a big ‘ole batch of plain Peanut Butter Fudge if you just don’t enjoy a thick layer of lusciously creamy chocolate ganache. I personally can’t imagine that but I would never turn down a piece of the plain stuff either. I’ve also recently added a recipe for Buckeye Fudge that is made using peanut butter, powdered sugar, and butter. Be sure to check that recipe out too. 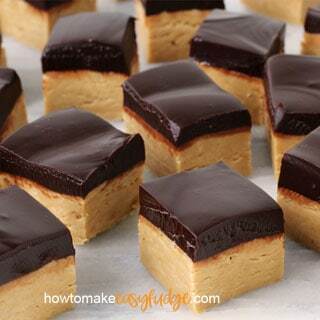 You will start by making a layer of plain peanut butter fudge then swirl on the chocolate ganache layer. This easy fudge recipe requires only 6 ingredients and can be made in either an 8 inch or 9 inch square pan. I suggest lining the pan with either non-stick tin foil or parchment paper for easy removal. 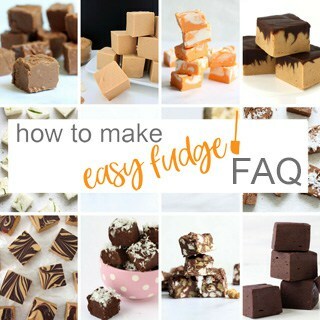 See the How To Make Easy Fudge FAQ page for more details on choosing the right pan, lining the pan, and more answers to your questions about making easy fudge. 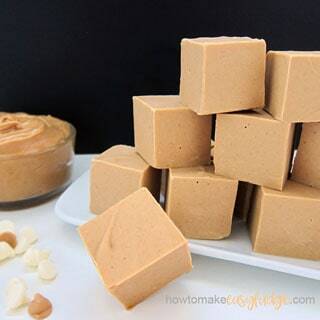 I choose Jif Creamy Peanut Butter to make this fudge but you can use your favorite brand. 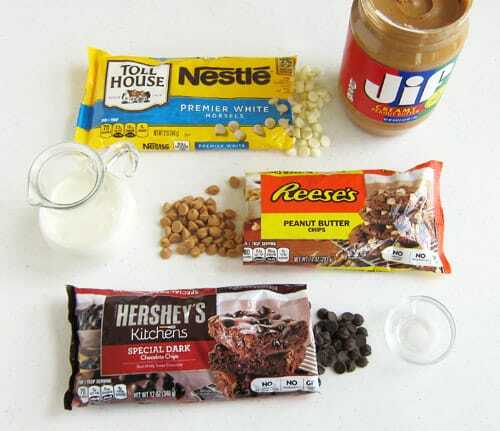 I use Reese’s Peanut Butter Chips, which are a peanut butter flavored confectionery coating (see details below). 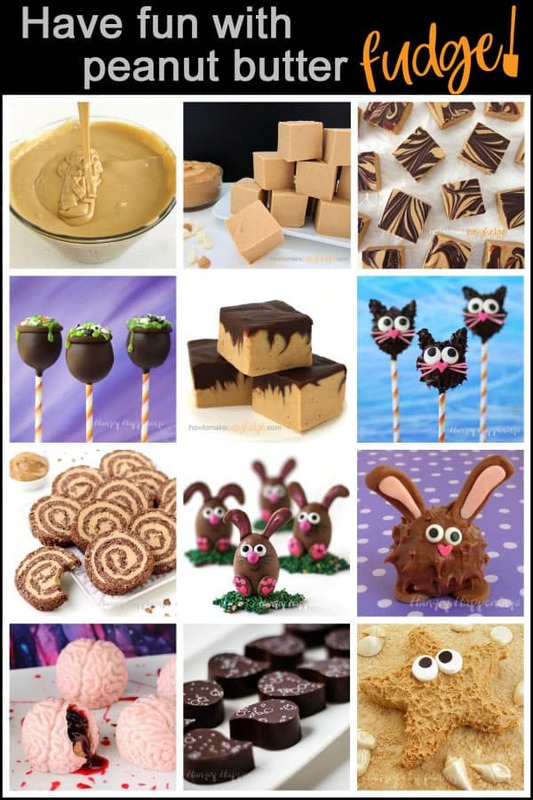 You can also use Mercken’s Peanut Butter Candy Coating or Wilton Peanut Butter Candy Melts. I use Nestle Premier White Morsels which are actually a confectionery coating. They taste great in this recipe. 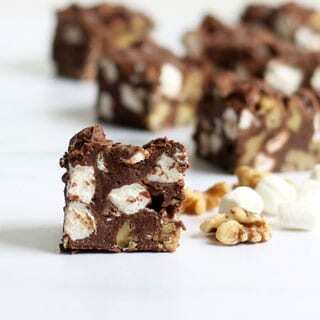 Confectionery coating, also known as candy melts, white almond bark, melting candy, or candy coating, is a chocolate like product that uses a vegetable oil in place of cocoa butter. 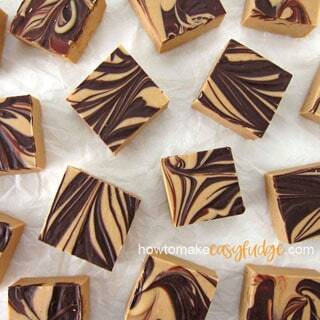 Salt will enhance the peanut flavor in this chocolate peanut butter swirl fudge. You can use semi-sweet chocolate for a nice mellow chocolate layer or use bittersweet for a more robust flavored chocolate layer. Choose any dark chocolate that you like to eat straight out of the package. If you use chocolate bars you’ll want to finely chop or shave the chocolate so that it melts quickly. You can also choose to use chocolate chips. This high fat-content dairy product will make the chocolate layer decadently rich. Fudge with a layer of chocolate ganache can be stored at room temperature for up to 2 weeks. If you need to keep this fudge longer than two weeks, store it in the refrigerator. Or use 1 (14 ounce) can of sweetened condensed milk in place of the heavy whipping cream. If you do that the layer of fudge will be too thick to swirl into the peanut butter layer. You’ll need to chill the peanut butter layer for at least 30 minutes before adding the thicker layer of chocolate fudge. 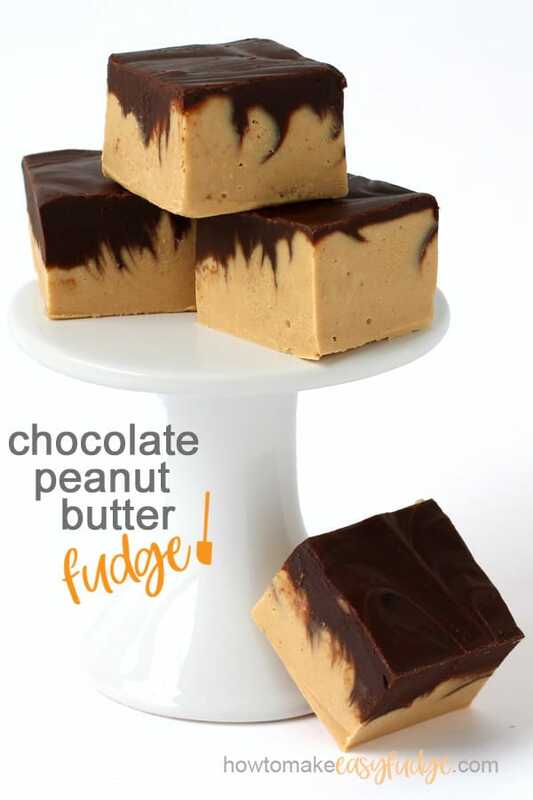 You can find all the ingredients needed to make this chocolate and peanut butter fudge on amazon (commission earned for sales). Melt white and peanut butter chips in the microwave. Microwaves are not all created equal so use the recipe instructions below as a guide. Just be sure to use short burst of power so that you don’t burn the chips. Stir in the peanut butter and salt then pour the fudge into your pan. Melt the chocolate chips and heavy whipping cream in the microwave. Stir the ganache slowly just until it comes together. If you over-mix the ganache it can become grainy. Pour over the peanut butter layer then use a knife to swirl the layers a bit. You won’t notice the swirl on top but it will swirl on the interior of the fudge and look really pretty once the fudge is cut. Cover the fudge and allow it to firm up at room temperature for about 8 hours or overnight. Fill a saucepan with 1 inch of water and heat over low heat. Set a bowl, that does not touch the water, over the top of the pan. Pour the peanut butter and white chips into the bowl and allow to melt, stirring as needed. Remove bowl from heat and stir in peanut butter and salt. Heat the heavy whipping cream in a small saucepan set over medium heat until bubbles form around the edges of the pan. Pour over the chocolate, let sit for 3 minutes, then stir just until smooth. A thick layer of creamy peanut butter fudge is topped with a layer of chocolate ganache to make this amazing chocolate peanut butter fudge. Combine white and peanut butter chips in a microwave safe mixing bowl. Heat on high power in the microwave for 1 minute. Heat for 30 seconds then stir. If needed, heat for 15 second increments, stirring after each until melted. Add peanut butter and salt and stir until well combined. Pour into a parchment paper or non-stick tin foil lined 8 x 8 inch baking pan. Combine chocolate chips and heavy whipping cream in a microwave safe bowl. Heat on high power for 45 seconds. Let the bowl sit in the warm microwave for 3 minutes. Pour over the peanut butter fudge layer. 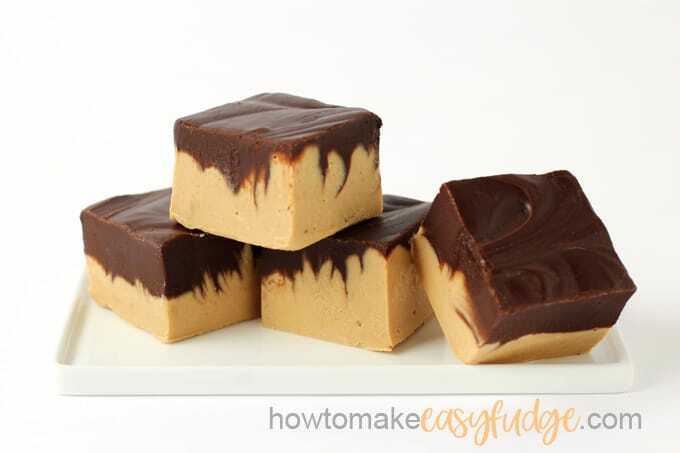 Draw a knife through the fudge to swirl the two layers together. Cover the pan with plastic wrap or tin foil and set it aside at room temperature for 8 hours (or overnight) until the fudge firms up. Remove the fudge from pan and peel off parchment paper or tin foil. Cut the fudge 32 pieces. Store in an airtight container at room temperature for up to 3 weeks. If cut into 16 large pieces, as shown in the video, each piece will have 434 calories. Or these other fun food crafts at HungryHappenings.com. You can even make Chocolate Peanut Butter Reese’s Cup Slime. Just so many fun ideas! 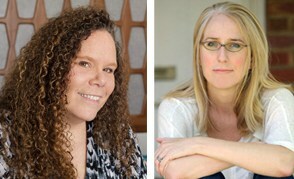 I think I just found another favorite…so great to know I can find all of my favorites right here! This fudge is definitely one of my favorites too! I hope you enjoy making it. You are welcome. I’m glad you enjoyed this yummy fudge. I will definitely be making this. Great recipe!! I know you’ll love it!!! I have to be honest that as I was making this fudge I was totally convinced it was not going to set up, but it did and OMG it is so incredible. I will never make any other chocolate peanut butter fudge again. Thank you so much for this unique recipe. I know, it is a very liquid fudge before it sets up. I’m so glad it turned out so well for you and that you loved the flavor.